I've been exploring some things lately; Enneagram Personality Systems, Jung-Myers-Briggs personality approach and now, Ethan has brought the Johari & Nohari Window to my attention. If you get a second, visit this site and lend a word or five. 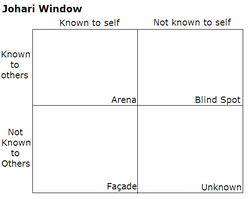 The Johari Window can be limiting here in digital reality but, those who have read here for a while may be able to assist- those that know me... really, really know me...go easy, OK? There is also an inversion of the Johari called Nohari, where you assess your negative personality traits. Please visit this site as well (those who really, really know me- and anyone else for that matter)!! Feel free to leave entries anonymously on either or both. Well, I tried, only coincided on one. But some caring/loving/kind seem to be redundant. I'll be curious to see how people who actually have met you fill this out. If nothing gives those of us in cyber land a better perspective on you! I don't know you well enough to pick 5, and it said I had to pick 5. I picked 'intelligent' and 'reflective'.